...or fight to restore honour to the realm as one of the brave heroes who unite to challenge him: Orlaf, the powerful human Barbarian; Madriga, the skilful Elf Ranger; Rordin, the immovable Dwarf Fighter, or Danor, the knowledgeable Human Wizard. Plus: Dice, Character Reference Sheets, over 70 Cards and over 100 Counters. Note: Models supplied assembled, but unpainted. Models are cast in several colours of plastic. 'Over a thousand years ago, Valandor, the greatest known hero fell in battle, fighting to protect the lives of those around him. From shore to shore, all owe thanks to his wondrous legacy. Now, sacred sites across the land have been defiled and plundered by the disgraced wizard Mortibris, who along with his vile undead minions will stop at nothing to obtain the secrets of Valandor’s power. Only the bravest heroes dare oppose him. Thrown together from the far corners of the realm, they step boldly into the depths, ready to face whatever foul evil awaits them…' If that doesn't scream out epic fantasy dungeon crawl campaign, I don't know what does. And that, to me, was one of Dungeon Saga's biggest draws. To read the blurb on the box and hear the game talk about what it was I used to go dungeon delving for, thirty years ago? That's a great sell for someone like me, so all I could do was pick the box up and hope that the game delivered. The box itself is a great sell, too. When you slide the packaging out from it's cardboard cover it's designed like a huge book, like a tome of lost knowledge, and inside you get everything you need - and you really do you get a lot. for £49.99 there's plenty inside. Tokens, books, but most importantly you get 26 assembled plastic miniatures, all fully detailed and paintable but don't worry; if, like me, you don't have an eye for model painting, they're all different colours so you can easily tell them apart. The detail on the miniatures is excellent and model enthusiasts will have a great time with them, as well as with the barrels, bookcases, doors and other paraphernalia that comes with it, but you may find some of them bent out of shape, or leaning off their bases. This is due to the packaging but Mantic have a helping hand and give some good advice on how to carefully get them back into shape, heating them up with hot water or a hair dryer and then (very carefully) bending them back into their poses. If one of your skeletons is bent at the waist and leaning off it's base like a drunken breakdancer, don't fret - it's all perfectly fixable. It's a shame that they had to include that, knowing how their miniatures might end up after shaking about in the box, and makes me wonder if they should have decided on miniatures a little more durable and solid. Still, they are a miniatures company so I guess they'd want quality in the box, but if you're a modeller then perhaps you should store them in a separate carrycase - I can't imagine what they'll be like after painting and then bouncing around in transit. Along with tiles to build the dungeons and counters to help keep track of everything, you get cards for items, spells and surprises that the Overlord springs, hero and villain stat cards and six-sided dice of two different colours, blue for the heroes and 'bone' (an off-white) for the bad guys. It's all good card stock and quite durable, and I do suggest you use the small clips that help hold the floorplan tiles together. First we need to talk about the box itself... All in all it's a great looking box and the weight and contents feel like they're worth the money you're spending. The outer box that covers the book-shaped box has some amazing artwork, and the artwork in the box is of a high standard, so production values are high. Not only that you get sealable bags for most of the stuff in there, as well as some spare empty ones to use once you've popped the counters and tiles out from their cardboard holders. Nice thinking, Mantic. The game is really simple - the heroes have to get across the dungeon map and not die. And that's pretty much it. There's undead to fight, items to pilfer and doors to get through, but the basic premise of the game is to get from one end to the other in one piece. The game can be played with 2 to 5 players, and in every game one player is the Overlord and the other players(s) have the heroes divided between them. Other than the introductory scenarios the four heroes (a human barbarian, a dwarf, an elf archer and a mage - I said it was old-school, didn't I?) are in play at all times and the player(s) control them all. The Overlord player is the one in charge of Mortibris, and he's sending his undead minions to stop the heroes at all costs. The Overlord decides who to attack, where to resurrect bad guys and what cards to play - he has his own set of cards so that he can issue extra minion commands to foil the players, or raise more undead, or basically make the lives of the players hard and miserable. The game is also set up so that the Overlord lays down the dungeon tiles as the game progresses. The heroes do not know what is behind a door until they open it, and this adds an excellent exploration dimension to the game. Basically, the players need to get to a door that gets them out of that section of the dungeon... so are they opening the right door, or will they unleash another hoard of undead baddies? Are they even going in the right direction? It's a whole other level that adds to the fun. The rules are simple - each character has three stats: Movement, Combat Dice and Armour (there are other skills but it all works in a similar way). Movement is how many squares you can move in a round, Combat Dice is how many D6's you throw in a fight, and Armour is how much damage you can soak up. The basic roll is this - each character throws their Combat Dice. The Attacker then removes any die that is equal to or is lower than the target's Armour score. Then the dies are paired off on each side, highest to lowest. For every die the attacker gets that is higher than the defender's, he scores a hit. For every die the defender has that's higher than the attacker's, they negate the hit. Work out the number of hits at the end and bam - you have your damage score. In each round, the heroes go first, then the bad guys, then the Overlord gets to play a card and mix things up a bit. There's a few more rules for magic and ranged abilities, as well as a few feats the heroes are capable of, but it's all generally the same. Sound simple? It really is. Put it this way - in an hour and a half, we had unboxed the game, set it up, and played through the first two scenarios in the campaign book. Now, that's great, and it meant I didn't have to lock myself away in my office and study the rules like they were ancient, undecipherable writings scrawled onto a tablet by a madman. I've played quite a few dungeon-style boardgames and they all have their own quirks, new ideas and levels of complexity, but as much as I enjoyed them it felt like a lot of book-keeping and complication. Sometimes I don't want to spend two hours learning rules, and then another two hours referring to a rulebook as we plough through our first game correcting all of our inevitable mistakes and saying 'we'll remember that for next time'. Sometimes I just want something with an old-school feel, with a simple system and a feeling that I'll not need a thousand tokens to accurately keep track of what's happening to my character. I just don't want that level of detail or pseudo-realism. I want to go back to when things were simple, when my rules were about as complicated as what I got in my solo gamebooks. And that's what Dungeon Saga gives me. It's a simple system that may take a roll or two to fully grasp - and I guarantee that my description above does not do it any kind of justice - but once you're on board it's simple, quick and intuitive. There's not a lot of token tracking, something I'm not a huge fan of, and instead of worrying about what token should be where and if that gentle gust of wind or table-knock has messed up your perfectly laid-out character you can just get on with the fight. Simple does not mean dull; there's enough complexity to make the game tactical, and more than once there were moments when the balance of a game shifted because one hero got cut off, or was injured and unable to perform properly. The mechanics may be simple but it allows you to concentrate on what makes the game fun; wandering dungeons and beating up bad guys. My only issue with the game is the fact that I never really felt it gave you the option to branch out from the scenarios in the admittedly lengthy campaign in the book. There is nothing stopping you from designing your own dungeons (as long as you take into consideration the dungeons explored in the book and how they're designed so that you don't create a simple death trap) and pitting the players against new threats. I also felt that the constant stream of undead was a little lacking and that other monsters and threats should have been included, but there's nothing stopping you from using other miniatures and creating your own stats for other creatures. There are expansions for the game available and will no doubt expand on the core game, but what you get in the box gives you plenty to be going on with, and with a little creativity you can get a lot more out of it. 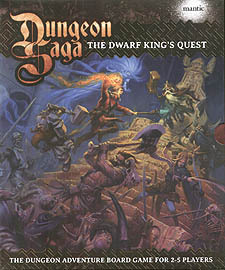 Dungeon Saga is a blast to play. It's fast, simple and easy to get into, and the dynamic it creates around the table between the player's heroes and the Overlord trying to stop them makes for some good ol' fun times, and at the end of the day there's nothing quite like kicking down a door and laying waste to the foes beyond for fun and profit. It's simplicity makes it a great game to play for any age, too, and I've already used it on family game night and it went down really well; my nine year old son took great pleasure in helping to rid the world of evil. It might not bring anything new to the table, but Dungeon Saga takes a step back from the complication that a lot it's competitors revel in and says, 'let's have some fun with this'. And that's all I really want in a game. Highly recommended.